Stunning watercolor paintings illustrate the classic tale. Everyone knows the story of the wooden puppet who, after many trials, succeeds in becoming a real boy. Now renowned French illustrator Quentin Gréban brings his unique vision to this old favorite. The text has been carefully edited to preserve all the flavor of the original. 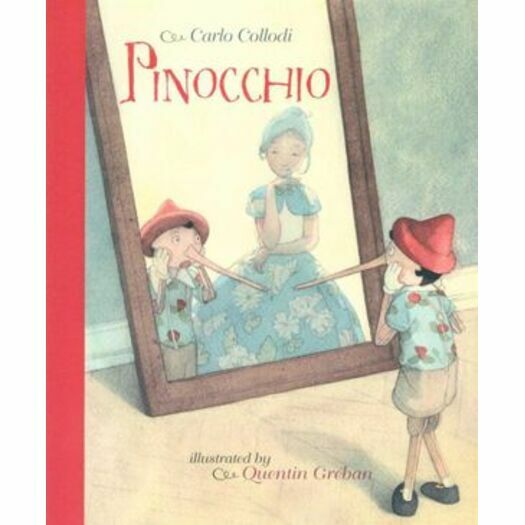 Carlo Collodi (1826-1890) was the pen name of Carlo Lorenzini. A native of Florence, Italy, he was a novelist and playwright. Pinocchio was first published in 1881 as Storia di un burratino (Story of a Puppet) in installments in a children's magazine. It appeared in book form in 1883 as The Adventures of Pinocchio. Quentin Greban was born in 1977 in Brussels, Belgium, where he still lives today. His books are published throughout the world. He received the Saint-Exupery Award in 2000, and his work was twice selected to be honored at the Bologna Children's Book Fair.